There had been whispers of a magical hidden alcove within the Fenix Forest of Ameral Alley for years, but according to legend, no one had ever found it. Seventeen-year-old Halia Bodine, a girl with a medically baffling rare lung disease, begins dreaming of a map that leads her to the hidden alcove of Moa’s Rock. In the depths of this magical alcove exists the vibrant underwater world of M’deia, with its hunter tribes, alluring creatures, ghastly beasts, and untouched lands. 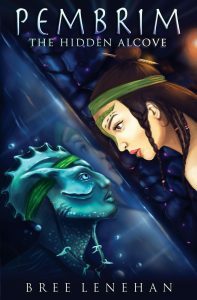 After a fated encounter with Luka, a M’deian boy in exile from his clan, Halia enters this mythical underwater world. Once there, she learns that her illness ceases to exist, that she loves without reciprocation, and the cold truth of her parents’ death. When her family heirloom — a timepiece cursed with the power to end all lives of the sea’s inhabitants — is found in an ancient enemy’s wicked hands, Halia soon discovers that this world is not without its own lurking dangers. First, her foe turns the tribes to stone. Next, he wants Halia dead. When Halia comes face-to-face with her fears, will she finally have the chance to go back in time and save both the stone tribe and her parents from their unfortunate deaths, or will her enemy destroy her and all she holds dear before she can? Find out in this wondrous tale of friendship, mystery, and sea-crossed romance. Throughout my teenage years, I’d adventure through the backwoods of my grandparents’ property, that’s when I found a private waterhole. It sounds magical, but really it was just a muddied riverbed. Still, my imagination went wild with impossible happenings, and before I knew it, Luka (one of the waterclan warriors in Pembrim) was pulling me inside and I just had to write about his world! I suppose I just wanted to write the story I knew I would’ve loved to find at my local bookstore or read growing up. Halia Bodine (my MC), who lives with a medically-baffling rare lung disease, was created by taking bits and pieces from everyone I loved. I was inspired to write a story that didn’t follow the usual ‘I can conquer anything!’ heroine. The other characters in Pembrim are of a different species, one I created specifically for this story… They are the M'deian water-clan warriors – emerald green in colour, their scales shimmer like pure white stars and their eyes glow pearl-blue. Dark green markings cover their bodies from head to toe. A vibrant, patterned tail grows from both sides of their waists and stands aside their legs. Because of it, they can swim extreme lengths in unbelievable time. Not only does it give them speed, but strength, enough to break one's arm without even trying. A coral trident is handmade by each warrior as his time comes. As for female warriors, they must use only spears… It is their way. I wanted to create a never-seen-before world, and as previously mentioned, it was almost as though a being of this species popped into my imagination and dragged me into his world. Taking Halia's hand into his, Luka rubbed it nervously before speaking, "You said fire was wild with colour, that it grows quickly, needing to be stopped… That it's destructive, dangerous, and beautiful at the same time. Which made me realise, we are the fire." Halia pulled her hand away from him with her response, "If only you'd understood the fire. It was a spark that you ignited but you chose to burn me instead."